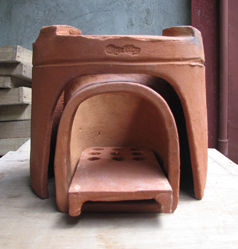 An eco-KALAN is a portable stove made of clay consisting of three components: the outer shell (kalan) on which the cooking pot sits; the inner chamber (rocket elbow) where the combustion takes place; and a shelf with air holes to hold the fuel. The space between the kalan and the combustion chamber is filled with wood ash for insulation. Pilot Lunch Program for 40 school days in Dumaguete City, Negros Oriental, Philippines starting on January 11, 2010. Program is funded by the Philippine Government and administered by the Department of Education. Introducing the Eco-Kalan-C and Eco-Magic Box to the Lunch Feeding Program. This video demonstrates how to build an Eco- Magic Box; and how to use the Magic Box and the Commercial (C) Eco-Kalan in the Lunch Feeding Program at South City Central School in Mangnao, Dumaguete City, Negros Oriental, Philippines. Avocado Eco-Kalan Presentation, February 19, 2010. Avocado is a mountain community in the town of Sta. Catalina, Negros Oriental, Philippines. Donors from British Columbia, Canada are Kees & Rebecca Arrieta Vermeer and the Chilcotin Log Church. Avocado is unique in that it was and continues to be a base for insurgencies by the New People's Army. The projects are supported by non-profit organizations in British Columbia, Canada. 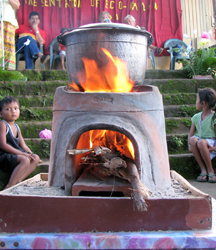 Stove development has been in collaboration with Nate Johnson and Mark Bryden of Iowa State University and Sebastian Africano of Trees Water and People and Aprovecho Research Center.